One of the first to leverage the spectacle of parkour in cinema was founder David Belle himself. 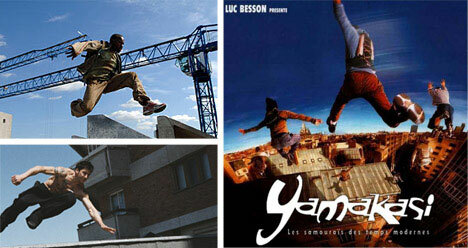 In 1997 Belle created a group of traceurs (parkour practitioners), free-runners, and street acrobats called Yamakasi. Inspired by this group, Luc Besson scripted a heist film by the same name in which the Yamakasi clan rob from the rich to pay for a heart implant for a young boy injured while imitating their stunts. Here’s a couple of thrilling sequences where they’re being chased by Doberman Pinschers and over the rooftops (a popular parkour theme) by cops. The success of Yamakasi led, understandably, to a sequel, Les Fils du Vent, in which the Yamakasi crew travel to Bangkok, Thailand to fight the Yakuza. In the opening credits, Yamakasi play a (highly competitive) game of capture-the-weathervane ball across the rooftops of the city. Check out some of the Capoeira-style soccer kicks. We’ll see more of that later in this post. Perhaps the best known example of parkour in film is from Banlieue 13 (District B13), a Luc Besson-produced action flick about a government conspiracy to nuke the most gang-infested ghetto in Paris. In the film’s riviting opening, David Belle narrowly escapes the persistent and agile thugs sent to get him. Watch how fluidly he slips from one floor to the next! One of David Belle’s fellow traceurs in the group Yamakasi was Sébastien Foucan. He’s also one of the founders of free running, a discipline similar to parkour, but with the focus being more on the movement aesthetics (although they are sometimes considered interchangeable). In the opening of Casino Royale, Foucan’s character, Mollaka gives James Bond a chase that would be an acrophobic’s worst nightmare up an unfinished construction site in the Bahamas. Most people probably wouldn’t expect to see parkour in a film by the late Anthony Minghella, director of The English Patient and Cold Mountain. In 2006’s Breaking and Entering, Rafi Gavron plays Miro, a traceur hired to break into architectural firms. Here’s a compilation of scenes of some of the impressive stunt work from this film. As soon as advertisers realized they could make a buck or two by exploiting the panache of parkour they wasted no time doing so. To its credit however, Nike went one step further in its “Presto” campaign by approaching parkour with a much-needed humorous tone, proving it didn’t have to be pigeon-holed into the action genre. Here’s David Belle (again), going above and beyond the call of chivalry for a very fickle lover, who’s got a little surprise for him. Now it’s Sébastien Foucan’s turn in the spotlight, fleeing for his life through city streets and rooftops, from the angriest chicken ever. The traceur featured below is Chase Armitage, a key member of a crew called 3Run. Chase has been engaging in parkour and freerunning since he was 14, and it shows in this XBox spot. It’s amazing how the high-speed photography demonstrates how fluid and graceful moves which normally occur within a fraction of a second can truly be. The spoken text also elegantly captures the spirit behind freerunning. And once again, here’s the incomparable David Belle, a little older, yet still in phenomenally good shape, performing some pretty nifty acrobatics in this BBC One commercial. Ever the iconoclast, Belle improvises his own way to beat the rush hour traffic home to watch some telly. Finally, not technically parkour, here’s a commercial featuring a particular type of street acrobatics known as Capoeira. Capoeira originated in Brazil and is distinguished by its fluid kicks, sweeps, and headbutts. While some of the ball-passing has probably been executed in CGI, the acrobatics themeselves are nevertheless impressive to watch. Check out Cineleet for insider film information, footage and triva.